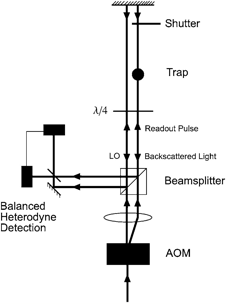 We review the development of a gravimeter based on a single state atom interferometer. 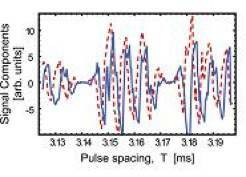 Two standing wave pulses separated by T are applied to a sample of laser cooled Rb atoms. 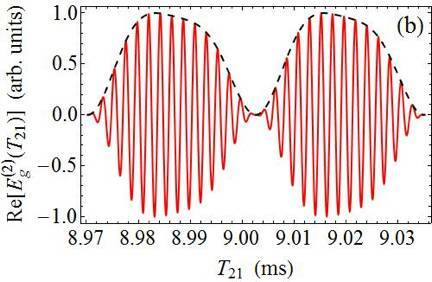 The traveling wave components of the excitation pulses are far detuned from the excited state. The atoms evolve into a superposition of momentum states separated by 2ħk and produce a density grating in the sample. The grating dephases due to the velocity distribution and is rephased by the second standing wave pulse near t = 2T. The rephased grating has a period of λ/2, where λ is the optical wavelength. It is detected by coherently back scattering a traveling wave readout pulse. The backscattered signal, known as an echo, is detected using a balanced heterodyne detector. 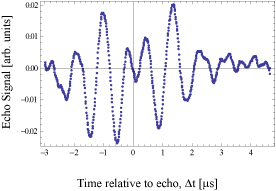 The phase of the echo signal is measured relative to an optical local oscillator and is sensitive to the motion of the inertial reference frame. 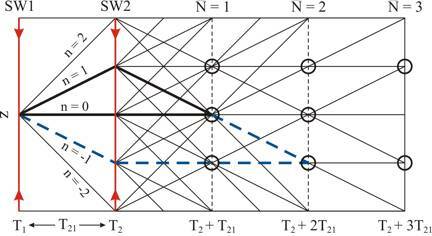 The accumulation of phase as a function of T, which scales as gT2, can be used to measure gravitational acceleration g. The main challenges in this experiment include passive and active stabilization of the apparatus to avoid the effect of vibrations. 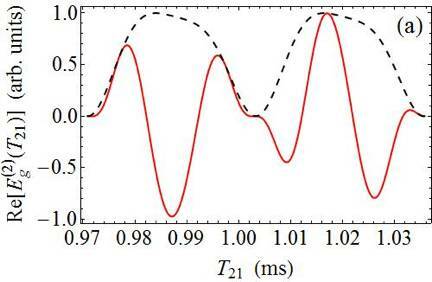 The echo envelope also exhibits temporal oscillations consistent with theoretical predictions that can be detected as a Doppler shift and used to infer g.
Effect of a Magnetic Field Gradient and Gravitational Acceleration on a Time-Domain Grating-Echo Interferometer, M. Weel, I. Chan, S. Beattie, A. Kumarakrishnan (York University), D. Gosset (UBC), and I. Yavin (Harvard U), Physical Review A 73, 063624 (2006). 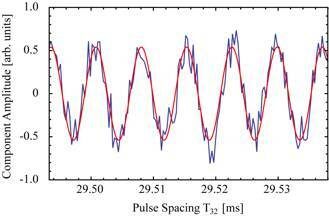 One component of the signal envelope for a fixed value of T, showing the effect of the Doppler shift due to gravity. (a) Recoil diagram for two-pulse AI; (b) Predicted modulation of back scattered E field (solid line) and signal amplitude (dashed line) as a function of T (=T21). The interferometer phase ϕAI exhibits a chirped modulation due to g and a modulation due to recoil with period 32 ms.
(a) Recoil modulated in-phase (dashed) and in-quadrature (solid) echo signal components for the two-pulse AI as a function of T in stainless cell. 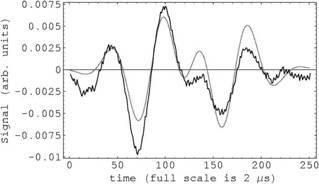 To obtain cos (ϕAI) and sin (ϕAI), each signal component is normalized using the total signal amplitude. A measurement of the chirped frequency of ϕAI using four observation windows and a time scale of 20 ms resulted in a measurement of g precise to 5 ppm; (b) Recoil Diagram for the three-pulse AI; (c) AI signal lifetime for two-pulse and various three-pulse configurations in a glass cell with a sample temperature of T ∼ 20 mK. The horizontal axis is the time of the read-out pulse, TRO, relative to the time of trap turn-off, T0, which signifies the start of the experiment. The three-pulse AI is less sensitive to B gradients and vibrations than the two-pulse AI. 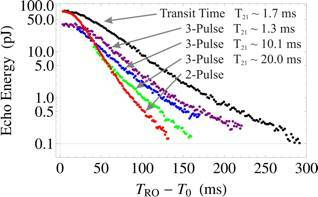 Decoherence due to these effects is limited by adjusting the pulse spacing T21, which controls the separation between wave packets so that the measurement time scale is comparable to the transit time.